HBO Filming Scientology Documentary Based on the Book Going Clear – Zero Equals Two! HBO has announced that a new documentary on Scientology is in development based on Pulitzer-prize winner Lawrence Wright’s Going Clear: Scientology, Hollywood, and the Prison of Belief (Knopf, 2013). And they’ve prepared by hiring 160 lawyers to review the film. Alex Gibney, who snared an Oscar in 2007 for Taxi to the Dark Side, is directing. The film is expected to debut at the 2015 Sundance Film Festival. 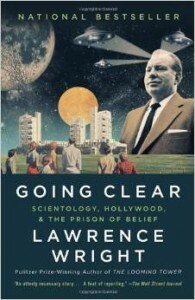 Going Clear was a finalist for the National Book Award and the National Book Critics’ Circle. Wright interviewed 200 current and former Scientologists for his book, whose accuracy the Church of Scientology has challenged through an official statement in its newsroom and a blog post of refutations. Wright’s UK publisher, Transworld, decided not to publish the book there citing legal concerns. Going Clear devotes a bit of space (pages 52-57) to recounting the details of Scientology founder L. Ron Hubbard’s involvement in the circle of OTO’s Agape Lodge, particularly rocket scientist Jack Parsons and his girlfriend Sara Northrup. The book also quotes Hubbard’s eldest son (L. Ron Hubbard Jr., later changed to Ronald DeWolf, nicknamed Nibbs), who alleges that when Crowley died in 1947, “That’s when dad decided that he would take over the mantle of the Beast and that is the seed and the beginnings of Dianetics and Scientology” (Going Clear, p. 55). The Church of Scientology vehemently denies any connection with Crowley. It will be interesting to see if HBO’s documentary touches on any of this.